Despite the creeping understanding that you might begin to find this work of mine to be a tedious interruption of your intellectual life, I never tire of pointing the finger at my sub-sub-sub-field colleagues. “Colleague,” and “palaeoanthropologist” are not, by the way, words that’re often used in the same sentence as “Rob Gargett.” Believe me. I’m not bothered by it. Nor am I particularly bothered that, in aggregate, Middle Palaeolithic archaeological research is not much more than “an Heap of Conspiracies, Rebellions, Murders, Massacres, Revolutions, Banishments; the very worst Effects that Avarice, Faction, Hypocrisy, Perfidiousness, Cruelty, Rage, Madness, Hatred, Envy, Lust, Malice, and Ambition could produce.”* But, I’m not bitter; just very busy trying to school those comprising the heap, none of whom am I! I say that I’m not bitter, because I’ve reached a level of enlightenment that few, I think, have imagined. Unfortunately, for me enlightenment is a dynamic process. Thus, each time I come across a mistaken inference in the literature, I am forced to transit each of the five stages of enlightenment all over again. Thereafter comes anger. Alas, this is where my residual bitterness exerts itself. I often address myself at such times, with explosive effect. It almost always begins with, “How in the bejeezus . . .” I think you can fill in the blanks. Depression follows whenever I feel as if I’m losing the high ground of the intellect. It’s cathartic, in a way. But it’s quite dangerous, because this is the tilting point, and I could quite easily take the downward emotional path and fervently hope that I’ll never write another word. That’s what’s been going on, in large part, since about this time last year. So. Where were we? Oh, yes. We’re back at La Chapelle-aux-Saints, where, around 1908 a mostly complete skeleton of a Classic Neanderthal was found. 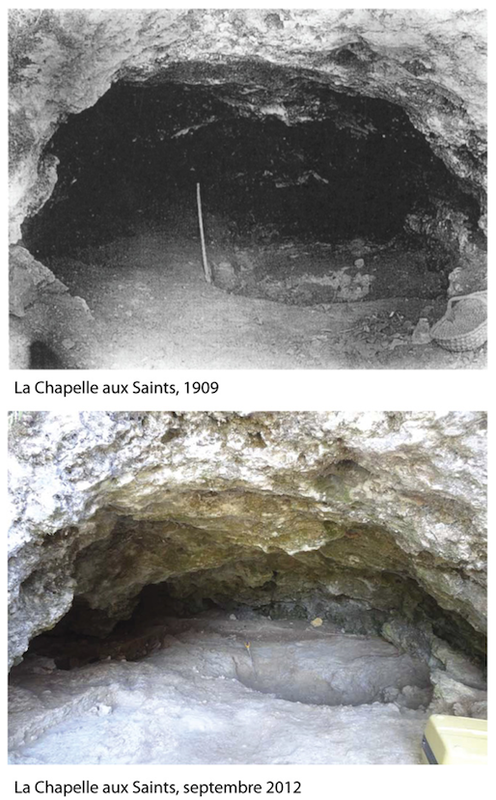 In “Grave Shortcomings: the evidence for Neandertal burial” I thought I’d done a pretty good job of dismantling the early twentieth century fairy tale that “The Old Man” of La Chapelle-aux-Saints had been purposefully buried. I’ve already thoroughly and [one would have hoped] persuasively shut down the recent claims by Rendu et al. that their exhumation of the so-called burial pit demonstrated that the skeleton was preserved because it had been purposefully buried. You can refresh your memory by having a look here, here, here, here, and here. I’d have hoped that these five blurts had exhausted the subject. But, I’ve found that no matter how many times you beat a dead horse, it stays dead! Below, at right you see my annotated version of the same plan based on the recent exhumations of Rendu et al. It reproduces the 1980 illustration along with the results of the latter-day excavations. As you can see, the newer outline is shifted slightly away from the preternaturally central position reported in 1908. The recent work, which we’re assured exposed the original “pit,” shows a slightly larger and ovoid in plan. It’s a kind of ovoid trapezoid, not a rectangle. As you’ll see in a moment, even the recent results as drawn are a departure from the excavated reality, I believe so as to perpetuate the claim that the “grave” was rectangular. What’s happening is clearly illustrated in the photo below, which shows a portion of the “grave” during the recent excavation. 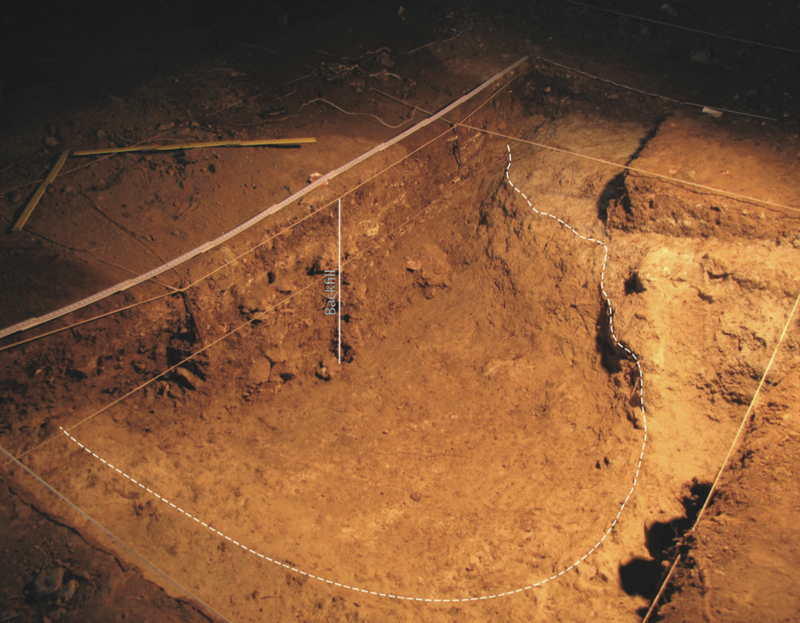 The dashed white line describes the shape, in plan, of the “burial pit.” You see where the margin closest to the photographer is not rectilinear. Far from it! 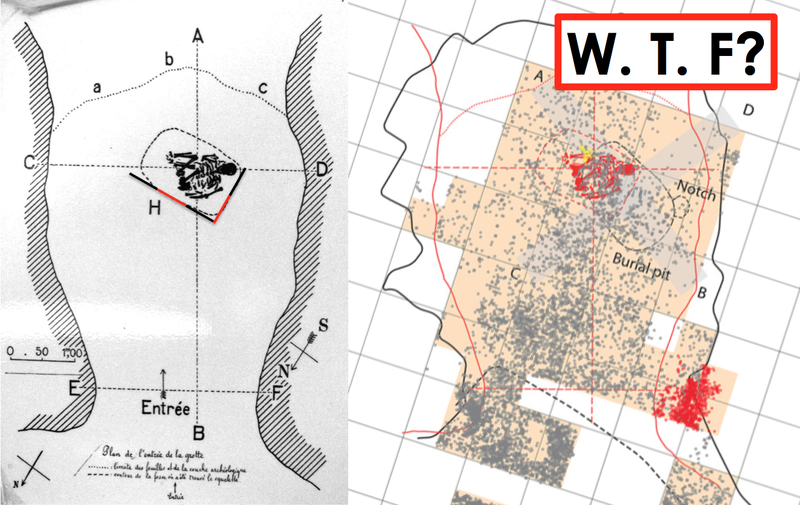 The kicker, as I see it, is the comparison of the site after the 1908 excavation, and a photo from exactly the same vantage of the site after the recent excavation. Neither appears particularly rectangular, rectilinear, or anything approaching a right-angle. The take-home message? Easy. 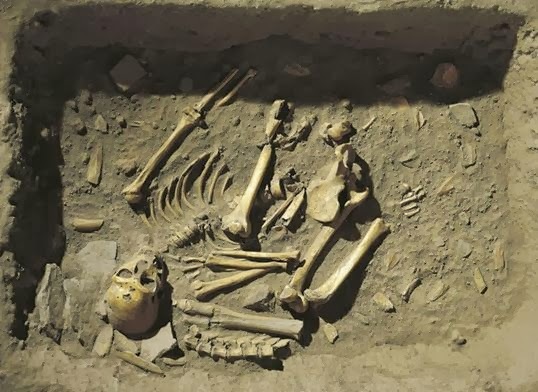 The well-meaning archaeologists of the recent excavation have drunk the Kool-Aid, and even when faced with reality, they have chosen to undertake special pleading and auxiliary hypothesis after auxiliary hypothesis, in maintaining a) that the burial was purposeful—even though the pit might have been naturally excavated the skelly was nevertheless puposefully buried, and b) the pit’s rectangular outline as recorded in 1908 was the truth, even though it’s really hard to get one’s eyes to turn an oval into a rectangle. This entry was posted in burial, La Chapelle-aux-Saints, other stuff, Rendu et al.. Bookmark the permalink. ← Forbs [sic] Ruled the Mammoth Steppe Flora For 50 kyr, Turning 50 Years of Palaeoecological Thinking On Its Head.